I really love Christmas. More than the average Christmas-lover (I think…but I’m willing to challenge any of you to a dueling Christmas face-off…any takers?). I love Christmas movies – my absolute favorite is The Muppet Christmas Carol. It’s music, it’s Muppets, it’s Christmas, and I really can’t imagine anything better. I love Christmas music. My favorite carol is Oh Come All Ye Faithful, but almost all of them are pretty great. And my favorite Christmas dessert is…oh jeez, how could I possibly pick? Gingerbread and chocolate and candy canes, persimmon pudding and pumpkin pie and yule logs and petit fours – it’s almost too much! And now one more sweet to add to my list – Christmas Spice Cakeballs. This is my fourth cakeball adventure (I keep saying I’m done with them, but I just can’t stop!). And the practice is paying off because these are my best cakeballs to date. I was worried that the spice cake would be overwhelming, but it’s really not at all. And I dipped them in a mixture of milk and white chocolate – yummm! Make the cake and let it cool completely. Remove it from the pan and crumble it up in a large mixing bowl. Mix in the container of frosting (don’t be afraid to really mix it in). Refrigerate the mixture for 30 minutes to an hour (this will make it easier to form the balls). Using spoons and/or your hands, form the cake into balls. The size is totally up to you, mine were about 2 tablespoons each. 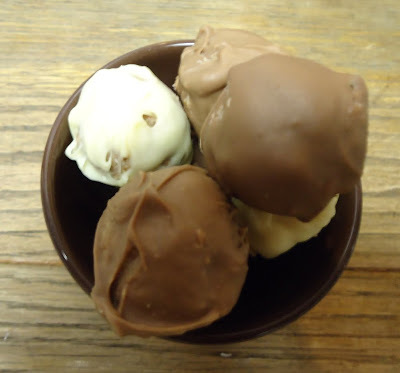 Tip: If you find that your cakeballs are too crumbly and aren’t sticking together, mix the cake more thoroughly, and if you’re still having issues, mix in a large spoonful of cream cheese. In a double boiler melt your chocolate. I did this in batches, since my double boiler is small, and I think it works better. Start with 3/4 cup of each kind of chocolate. I originally intended to do just white chocolate but I found that it doesn’t really behave in melted form, so I mixed in milk chocolate and that was perfect. Tip: You really must use good quality chocolate. (I’ve learned this the hard way.) The store brand just doesn’t melt very well. I was lucky enough to win 2 boxes of Guittard chocolate wafers, so that was perfect! Once they are cooled completely you should be able to store them in Tupperware. Or consume immediately.